When I read "If Only", knowing it was written by a seventeen year old teenager, I was taken aback. When that teenager is also my daughter, it brought tears to my eyes. She gave me permission to share. We are a culture obsessed with taking our place in line and following the rules. That methodology works well at the Department of Motor Vehicles and at Target stores, but it doesn't work when it comes to creative expression. In the creative space radical individuality wins. The best and brightest ideas move to the front of the pack where your place in line matters not. In the creative space, breaking the rules is the golden rule. Don't worry about putting the cart before the horse, not today. I suggest you ditch the cart all together, it's holding you back. 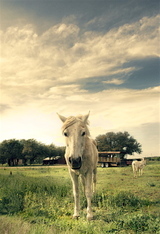 The horse without the cart runs so much faster and it's more fun to ride. I dare you to step out of line today and make a difference. Create your place. Never underestimate the power of your creative vision. Creative vision is the ability to envision something in whole or in part that does not yet exist. As a creative person you have been given an inherent ability to look at an empty canvas and envision that space filled to fullness. You see beauty where others see only the ordinary. You can look at a beat up chair at a yard sale and envision it fully rejuvenated to serve an even greater purpose than it was built for. You possess passion in expressing color, texture, life and energy just by speaking your creative vision. This is a gift that many times will cause people to respond in arrant awe. It flows out of you so naturally because it's a connected part of who you are. It has always been present in your reality. Creativity is an action, it's not a feeling. I've heard the phrase, I'm not feeling very creative used on more than one occasion. Creativity is defined as the state or quality of being creative. The process by which one utilizes creative ability. Creative ability can be greater in some of us and less in others. The more we unleash creative ability the better we will become at expressing our own originality and imagination. It's vital to use that which we posses. If creativity was a tool like a hammer, then it would only be of value when given purpose in the hand of the user. Without an action step it would lay dormant. The same can be said of a crayon, a pencil or an idea. I encourage you today regardless of how you are feeling to take action, pick up that hammer of expression and pound away until you are satisfied. You'll be amazed at what you can knock out. Pablo Picasso said; "the chief enemy of creativity is "good" sense." I believe that any burst of creativity comes without trying to think. It comes with great abandon, taking risks, experimenting and being courageous. It's in the letting go that we can capture a moment of focused brilliance. We should resist trying to edit or being our own critic at the same time as we are plunging headlong into our creation. It stifles the process of discovery. Creativity is being vulnerable as we expose ourselves to the unknown. Above all, dare to create.